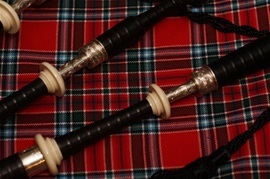 The Great Highland Bagpipe can be a wonderful way to add a Celtic flavor to your wedding. The first thing you should know, however, is that there is no such thing as a "Traditional Scottish Wedding". I have played the bagpipes for numerous weddings. Each and every wedding I have participated in has been unique. You should utilize the bagpipes when and where you think it is most appropriate. After all, it is your wedding! The bagpipes are a perfect way to welcome your guests to your wedding. The bagpiper, strategically placed, can not only entertain your guests with the prenuptual music, but also serve as a beacon to help guide guests to the wedding location. 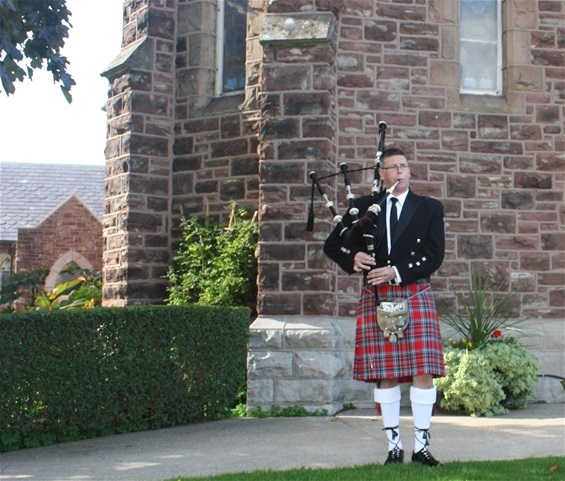 For church weddings, the bagpiper can play on the church steps as the guests arrive. For garden weddings, where the bagpiper is often the only music, the bagpiper can be placed so that they can both entertain those who are already seated and also guide the arriving guests to the seating area. Some newly married couples chose to be announced to a joyous sound. After signing the registry and the newlyweds are introduced to the gathered guests, the bagpipes can lead them up the aisle and out of the ceremony. Nothing is more spectacular than the newlywed couple being led into their reception or to their table by the bagpiper. The bagpiper can also welcome arriving guests to the reception area.